Ask fellow campers about "Alpen Rose RV Park" and nearby attractions. First, the negative...my experience was that the office did not answer the phone each time I called. I left a voice message; they returned my call only one time/day in the afternoon. The first time, my caller ID said something like private number or unknown number so I did not answer. The woman who placed the call did leave a message, which was from Alpen Rose. I called back immediately but again, my call was not answered. My call was returned the following day in the afternoon, which I answered this time. The person was very friendly and helpful re: an RV site and other information. Our stay was early to mid-October so the park was very quiet with only a few sites taken. We stayed in the newer "field" area, which was easy enough to maneuver our 40 ft. motorhome. Our MH filled the site; however, we were able to squeeze in our Jeep toward the back so were able to park at the site. Others with larger vehicles parked along the fence line. Gravel roads/sites, no problem with water or electricity, very large dog play area. Nice views. Location is good with easy access off 550 with flat terrain. WIFI was great during our stay. We do not use a satellite--only antenna for TV--so can't comment on satellite reception. They could spiff up their entrance...mow, trim, etc. Overall, after the initial frustration when trying to make a reservation, we enjoyed this park and would stay here again. We camped at Alpen Rose RV Park in a Motorhome. Take a stroll along the paved/concrete walk along the river in town. Several breweries if you are interested in local beers. Our favorite was the dark stout at Steamworks, which also has very good fish tacos. This park is about 5 miles north of central Durango. The front section of the park has the "premier" sites which are pull-through for larger RV's. The back section has lots of trees with mostly pull-in and back-in sites at all kinds of angles, generally smaller and tighter spaces. We were given a site in the back section for our motorhome. It was a pull-in with 30 amp electric service. It was badly unlevel, particularly side to side. I keep telling myself to avoid parking under trees because of the bad things that can fall on you such as sap, bird poop, etc. In this case we ended up with what looked like a fine spray of some sap. There is WiFi but it just barely reached our site and was rarely usable. We had to go to the office to get any use from it. The bathrooms are OK, decent condition and reasonably clean. All things considered, it's not a bad park but we did not like our site, #27. Pay attention to your receipt. We were initially charged $4.50 per day for an extra vehicle. Their website specifies that the rates include two people and one tow, which is what we had. We went to the office and they refunded this erroneous charge. We paid $48.15 per night. We camped at Alpen Rose RV Park in a Motorhome. We had an issue just trying to make a reservation. We tried online, our credit card was charged the $100 deposit, but we received no confirmation. After leaving several messages and emails, we finally heard from them weeks later that the reservation was made. When we arrived they had "lost" our reservation. (Even though I had the confirmation email). We are a 43 foot class A motor home and had reserved a "premium RV site". They first put us in a too small spot (no room for our tow vehicle). They advertise cable and pool...that means open air antenna and an above ground pool. Because of the trees we couldn't use our satellite and got no channels with the antenna. We were so close to the RV next to us that I could see in their windows. When I asked to move to a different spot, they were rude and unhelpful. After threatening to leave, they reluctantly agreed to move us to another site. Will not return here and recommend you look elsewhere. The location is nice and they could do a lot better with adequate management. Not sure who to blame. We camped at Alpen Rose RV Park in a Motorhome. Park is clean, grounds are well maintained. We were in a motorhome in the big rig area, which is set up with one service site per pair of rigs. Thus your rig is nearly touching window awnings with your neighbor. Decent space however on the exit/picnic table side. Nice grass and shade there. Park does not offer a monthly rate, thus is way overpriced for a month stay. Talked with the owner about that, she explained that they had problems with monthlies in the past trashing the place and the rate structure gave them problems in getting rid of problem tenants. Maybe a few good steak dinners for the Sheriff would solved that problem. Owners and staff were very pleasant. Park has a great dog park area, where the dogs can truly romp, play, and swim in the muddy ditch around the park. Great feature! I downgrade my rating of Alpen Rose because: WiFi is a zero; ATT cellular service is nearly as bad; cellphone connection is marginal. Wifi is no better at the office. That can be fixed! We camped at Alpen Rose RV Park in a Motorhome. Durango is famous for the Railroad, that is a must do. This destination is a big hit with offroad drivers, and outdoors enthusiasts. Elevation of the park is 7000 feet, with beautiful vertical scenery all around. Durango itself is crowded, lots of traffic. It is located north of Durango and far enough away from Highway 550 you can't hear the traffic. Although we did hear the helicopters traveling back and forth to the fire and landing on a private ranch across Highway 550 from the park. The sound was not annoying and was interesting to watch this fire-fighting technique from our camp. The park is pet friendly with a large dog park. It has great showers and toilets and a large laundry room with modern and extra-large washers and dryers. They are pricey at $2.75 per load. There is a small above ground pool, entertainment pavilion with a corn hole game and an adequate on-site store with necessities if you need something. The staff was short-handed because the fire had caused a few of their workers to depart, but they were friendly and covered essential services, even though they typically provide a breakfast service and evening entertainment. The owners are on-site most days and very friendly. A plus in this park for both of us is it has an on-site trout pond with some very nice stocked Rainbow trout. We like to fish and eat fish! The fishing is embarrassingly easy and they will bite anything your throw at them. The fee to fish is $5.00 per fish, but they are of such good size that a single fish is more that you need for a single meal. The park provides pull-through gravel sites with full hook-ups (30 and 50 amp) with sewer connections. Most sites are shaded and all have picnic tables. Just a few miles north of Durango and great access to everything. NICE place! We camped at Alpen Rose RV Park in a Motorhome. We shared a buddy site with a work camper. Worst experience ever. Took up entire shared area, parked semi to block our view and even flooded shared area and our picnic table. Worse yet - the owners refused to do anything about it. Also heard complaints about promised sites being arbitrarily changed. Too bad. Nice campground with good views. We camped at Alpen Rose RV Park in a Motorhome. Areas under trees can leave sap on MH and toad. Washed off windows easily so we assumed it was water soluble. Newer sunny areas have wonderful grass and thick rock. The older area where we stayed was in dire need of more rock. We camped at Alpen Rose RV Park in a Motorhome. Make sure to eat at Serious Texas BBQ. There are two, eat at the one East of town, it has a lovely patio overlooking the Animas river. The food is awesome! Decent place. Had to change sites because of levelness issue. Tree sap a problem but it washed off OK. Close to Ouray, CO and only a few minutes from Durango. Little traffic noise. Plenty of shade. Laundry very good. Reasonably roomy sites. Be sure to double-check GPS directions to Alpen Rose. CG is off Rt 550, NOT off CR 203 We camped at Alpen Rose RV Park in a Motorhome. Close to Durango which is easy to navigate. Walmart in town. Ouray, CO is an hour north-very scenic drive. Maggie's is a good restaurant there (burgers). Box Canyon is well worth it. Animas River goes through Durango. Easy to get to, makes for a nice walk along the river. Durango-Silverton RR is great. This is a great park to use as a base when visiting all the attractions in the area. They are big rig friendly and easily accommodated our 44' MH and toad. The sites are gravel and maintained with various parts of the park having lots of shade or none, depending on your preference. There is a dog park and a dog wash. We did not use the laundry facilities but they appeared to be nice. The staff is very friendly and helpful. The office is stocked with tourist pamphlets and basic supplies and also offers free popcorn. They make their own pizza on site which is delicious and a nice option if you want to eat in and not cook. The only negatives are the poor wifi and the pool / no hot tub. Be prepared to use your own wifi or do without. The pool is tiny and they really should add a hot tub. We camped at Alpen Rose RV Park in a Motorhome. It's a lovely park in a quiet, lovely location but I think a bit overpriced for early May. We were greeted warmly, our packet ready upon arrival and the Camp Host guided us expertly into a site that just barely fit our 45' plus our dolly. The Durango & Silverton Steam locomotive passes by the campground each day with a cheerful whistle as they steam by. They offer a discount for their breakfast but we didn't partake. We camped at Alpen Rose RV Park in a Motorhome. Don't miss taking the train from Durango to Silverton. If you can afford it, do the observation car if you go in the summer. We were lucky that we had a warm early spring day. It climbs from 6500' to 9500' so there's a significant elevation/temperature difference....be prepared! This is really a nice park. It is much better than we expected based on the reviews. As nice as the park is, I have never been treated as poorly in 18 years of RVing. Based on information from RVparkReviews, when I phoned the reservation, I asked for a newer full size space up front rather than the older, cramped, out-of-level spaces in back. No go. We have a small rig so we were assigned a small space. 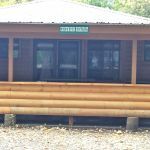 We went to Alpen Rose any way because the location suited our needs and no other parks in the area had better reviews. We arrive, and sure enough, we are assigned a dumpy little space under the trees out back. I informed the lady that I had an astronomy telescope and I would like an open space in front that is not under the trees. So, she assigned us to a new spot which is also in back under the trees. What? The golf cart guy and I went back in the office and requested a front spot for the third time. The office person states that those are 50 Amp sites, and "we are sold out of 30 to 50 adapters". I went out to my motor home and returned with my 30 to 50 adapter in hand. She relented and assigned us the worst front site immediately across from the maintenance shed where the lawn mowers were coming and going. I counted spaces that evening. 20 of 34 front spaces were empty, a 60 percent vacancy rate. Also, they had a whole pile to 30 to 50 adapters in the store. The park is an 8 or 9. The customer service is a 1 or zero. We scored them a 4. We camped at Alpen Rose RV Park in a Motorhome. Beautiful views, clean, dog friendly, quiet - loved it! We stayed for 4 nights and was assigned near the dog park. a 2 acre fenced in dog run. Surrounded by mountains and we could see the Durango - Silverton train go by each morning and afternoon. It was wonderful. It was a great base to explore Durango and Silverton. 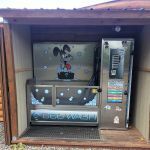 They have a dog wash that was terrific - wish more parks had this. Would definitely stay here again. We camped at Alpen Rose RV Park in a Motorhome. Convenient to Durango and dog friendly. Sites are nice, most with trees. The down side is that it's pretty expensive and there's really no hiking nearby without driving to it. 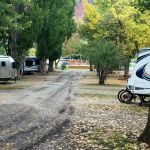 We camped at Alpen Rose RV Park in a Truck Camper. Nice pull thru with good cable tv and fair WIFI (worked pretty well except in periods of high demand). The office people were friendly and the pizza made to your order was perfect after the train ride. We camped at Alpen Rose RV Park in a Motorhome. The Silverton train was outstanding. We had an excellent dinner at Eolus Bar and Dining upstairs with a view of the mountains. The seafood stew was especially good. 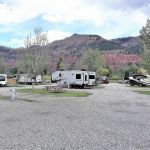 This is the best RV Park in the Durango, Colorado area, by far. Make sure you travel to Silverton and Ouray-Wow, what gorgeous mountains. A MUST, can't believe visitors do not travel into the Mts. Haviland Lake and the Pine River trail above Vallecito Lake. The Durango-Silverton railroad is a must. Consider riding train one way and bus the other. Train ride both ways takes a little longer and can be a little tiring. Great place - we will definitely stay there again - best place to stay in Durango. Get a site with no opposite unit sharing your hook up. Makes spaces very close - major negative for a nice park. Stay in the outer sites, you won't be sorry! Ride the train to Silverton and visit the old Streter Hotel bar. Be sure to go to Derailed Pourhouse in downtown Durango. It was a great meal and atmosphere. If you like breweries, go to Durango Brewing company for beer only - their food was not ideal. 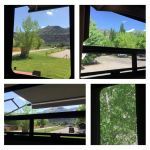 We did the Durango-Silverton train and it is a must do. However, I would recommend the train to Silverton and the bus back to Durango. We were on the train for 8 hours (3.5 hours to Silverton and 4.5 hours back to Durango). It made for a long day. The Durango - Siverton train passes in front of the park every morning and afternoon. Location is within hour drive of Mesa Verde National Park. Downtown historic Durango is about 5 miles South. Durango is a fun tourist town with great restaurants. There is a lot of hiking in the area. Also plan an extra day to take a trip on the Duango-Silverton narrow gauge railway. We took the train to Silverton and back. If we had it to do over again we would take the train to Silverton, sitting on the right side, and take the bus back. We also recommend the narrative coach. Don't miss the museum at the train station. Ask to see the 1886 Sleeper coach it's pretty interesting! Plan on spending the whole day if you go to Mesa Verde. Several decent restaurants in Durango, & Silverton & Pagosa Springs make good day trips. The Narrow Gage railroad is a favorite, shopping & brewpubs abound. Also enjoyed Handlebars pub in Silverton. The breakfast and pizza at Alpen Rose were excellent. We love Ken and Sue's Restaurant in Durango - it is one of our favorites for a nice night out. The Animas river trail was a nice place to wWlk the James farm on 550 was nice to visit,the steaks great, the drive up the million mile hwy is a must do. Durango's a great place to visit. The park is convenient to downtown area and local amenities. Consult local visitor guides for full information for visitors. Durango is a great town and Mesa Verde and hiking in the mountains are all within reach. Lots to do in Durango. 4 wheel, shop, hike, raft. Take the train to Silverton. Ride the train to Silverton. Durango is an amazing little town nestled between the mountains. The Animas river runs right through town and there's a ton of hiking, biking, eating, shopping, and sight seeing nearby. Make the drive up to Ouray - it's beautiful!! Old Tymers Restaurant was our favorite there. The Honeyville Store up the road is quite interesting. Fishing in the Animas River, shopping Durango, train to Silverton. Downtown Durango, the unbelievably stunning drive to Silverton, Animas bike trail. Visit Ouray & Silverton. Go horseback riding. Check out the microbreweries in Durango. Enjoy 4-wheeling!! Durango is a nice town to visit. The drive to Mesa Verde is very pretty and the trip is worth it. Reasonable breakfast each morning in the center of the park. So much to see and do, Bar D Chuckwagon fun. The Narrow Gauge train is across the highway, watch for the plume of smoke and listen for the whistle. Fiesta Mexicana is nearby and has very good Mexican food. Park offers breakfast buffet. Highly recommend the Durango & Silverton narrow gauge railroad trip. Only 2 miles from Durango. You can hear and see the Silverton Coal Fired train go by. River walk in Durango. Downtown Durango. Walk out back door of RV park and take a hike if you're fit enough - some nice places to go. Durango is very nice for shopping and eating. Mesa Verde is only about 50 miles away. Horseback riding, rafting and much more is available. You must take your bikes and ride the path downtown along the river. It was beautiful. You can see and hear the steam trains on their way to/from SIlverton from the park; closer views from the park entrance. A nice touch. Durango is a very fun town to visit. Some very good restaurants, great night life and a nice downtown for shopping, etc. Many come to ride the train - be sure to read that it will take all day. If you have pets in your RV you may wish to arrange for a pet sitter. Many area campgrounds offer that service. The scenery, rivers, activities, eating and shopping make Durango a good place for an extended stay. Plus at approx 7,000' altitude it cools off at night and doesn't get too hot during the day. Drive over to Pagosa Springs for a day trip . The location is ideal for exploring Durango and the surrounding areas like Mesa Verde, Silverton and Ourey. Are you affiliated with Alpen Rose RV Park ?